OMG!! It is so beautiful and sparkling! Love it! Was very skeptical about buying jewelry online. Happy with my purchase!!! At Amcor Design, our philosophy is simple: provide customers with exceptional value, finest quality jewelry, and positively the best customer service around. In striving to keep that philosophy, our jewelry is made of the highest quality metals, our diamonds are all-natural and conflict-free, we offer a 30 day money back guarantee, three years warranty and safe and secure online shopping experience. For customer service inquiries or to initiate a return, please contact Amcor Design at sales@amcordesign.com or 1-800-715-6380 or 212-354-2275. 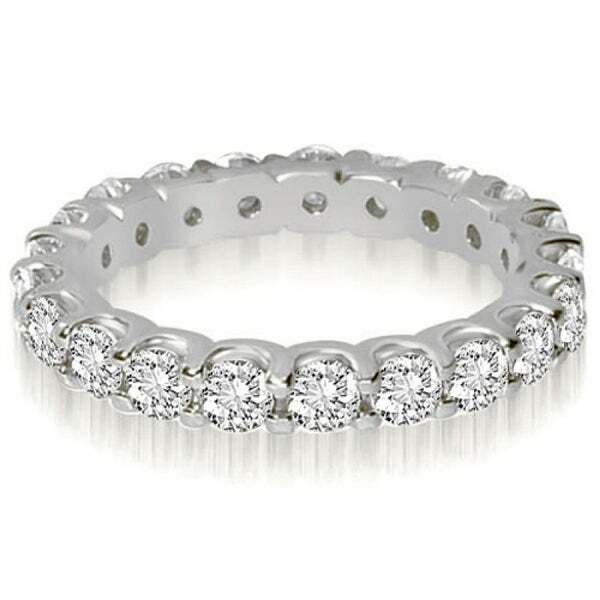 This elegant and classic eternity band is a stunning statement of beauty. This diamond ring features round diamonds in a shared-prong and low-profile design of 14k white gold. The diamonds, rated as SI1-2 in clarity and H-I in color, have exceptional brilliance. · Approx. Metal Weight: 3.1 Gr. · Carat Weight: 1.40 ct.
Beautiful high-quality ring box is included. The weight may vary up to two-tenths of a carat. Dimensions 10.0 In. X 5.0 In. X 4.0 In. 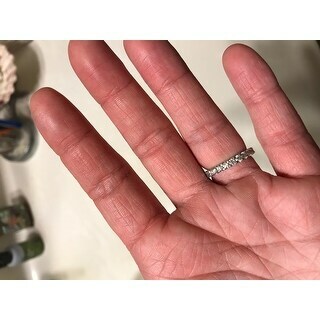 I searched far and wide for a nice eternity band to go with a past, present, future three-stone moissanite ring I got many years ago in white gold. First I looked at other moissanite rings but they were out of my price range believe it or not. 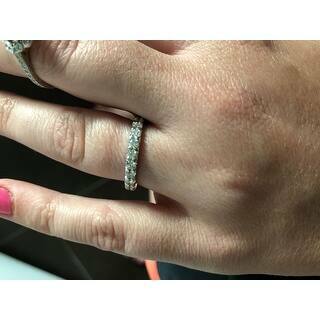 Then I found this one on Overstock and it was real diamonds in white gold. I had been advised to get something between 1 and 2 carats in order to look good with my existing ring so I went in the middle with 1.4 carats. 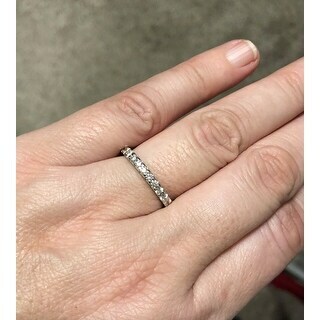 I bought a half size up on the conservative side but I think this ring is true to size and I would have been fine ordering a size 7. I was worried about the diamonds falling out so I tried to get one with a secure setting. I have had it several weeks now and it is absolutely gorgeous next to my other ring. I would buy it again and again but I only need one. The company is very nice to deal with and appears very reputable. The reason I became interested in an eternity ring is because I borrowed my mom-in-law's ring and got a lot of compliments. But hers was very cheap and the stones started falling out. 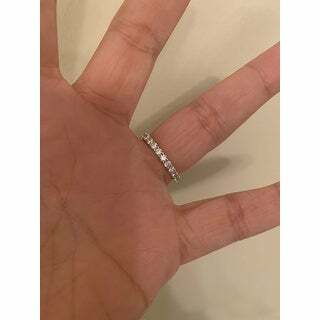 This ring I bought from Amcor is good quality and I am very satisfied. 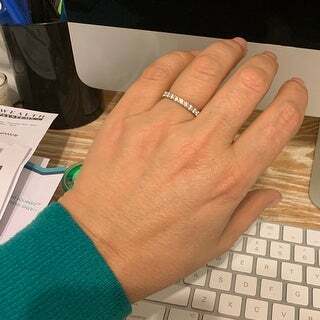 My wedding ring is an almost eternity ring but the gap of gold on the back is lighter than the diamonds so always winds around to the front of my finger (drives me nuts, I know "big problems I have lol). Anyway, I just bit the bullet and instead of paying a lot to have my wedding ring re-designed, I just bought this one on sale thinking it would be nice but probably not quite as nice as my original wedding ring. Boy, was I wrong!!! The diamonds are so beautiful, sparkle so much and are of such a great white color, it outshines my exceptional engagement ring! Whoops! It's ok, I am pleasantly surprised by the very high quality of the ring and love that it's a true eternity ring. I'm thinking of buying a 2nd to bookend my engagement ring! I'm treating myself after graduating from grad school :) GREAT buy!!!! The rings I purchased from Amcor Designs are beautiful! Excellent quality, and they match my diamond in my wedding set. The customer service was excellent, very nice to deal with. I purchased these rings to wear on each side of my wedding set. The diamonds are a beautiful white color and sparkle a lot! I love these rings. When I look to purchase jewelry at Overstock in the future, I will look for designs by Amcor Designs because they offer great quality. The eternity ring is smaller than it appears on the website. However, the diamonds sparkle and are good quality. The ring took over week to arrive and I didn’t like that. Once you buy the ring you deal with the diamond company and not Overstock for returns or repairs. The fit is excellent. It is an excellent price for a 1.4 carat diamond ring. An appraisal is included and this is nice. 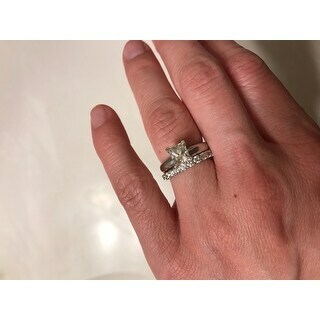 I cant even begin to describe this ring I received it in a size 9.5 which is the size I wanted and its it perfect not one law in any of the diamonds. the cttw size is accurate the feel of the ring i sturdy and look like if this ring cost three times what is selling for. 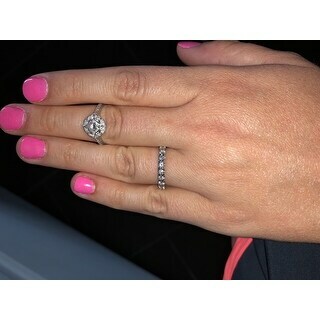 i have attached pictures of the ring so you can see for yourself. 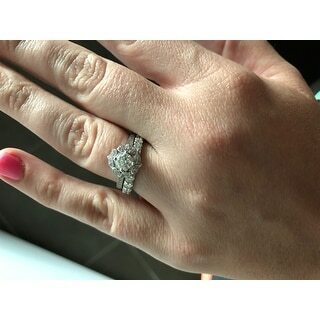 while I can not comment on durability and the stability of the setting hold each diamond I am confident in the seller and that they will stand by their product. 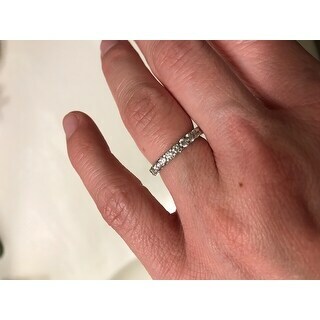 EDIT: after having this ring close to a year I have had it repaired at least three times, it is currently being repaired after having it for a bit over a month a diamond fell off and was replaced at no cost for shipping but I sent it a second time bc I got into the habit of checking the diamonds to make sure they were not loose and again a diamond was loose and they repaired it it’s now the third time for the exact same reason it’s a bit frustrating since they only guarantee it for a year. So I reduced it the two star review since after May I will not be covered and it has spent more time being repaired then on my hand. I purchased one in white gold, yellow gold, and rose gold. They look lovely together! Very pretty ring, I really like it. HOWEVER, one thing to keep in mind (I was a little surprised), the diamonds were not even close in size to what the product photo shows. I do have a size 9.5 ring, so I am assuming my diamonds were smaller because if the total carat weight stays consistent for all sizes, it would mean there are more smaller stones the bigger the ring gets (?) Possibly with a smaller ring and fewer diamonds, they would be larger? But it is still a very pretty ring and looks great with my other ring. I was glad to find something this pretty in such a large size. 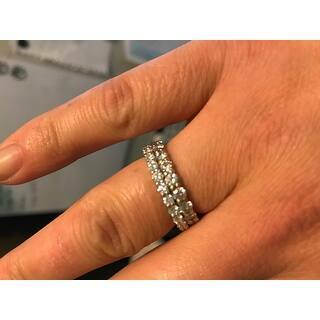 And I love the fact that it is an eternity band. Overall happy with my purchase - and a great price! I received my ring today and it is much nicer than expected. I was worried about purchasing jewelry like this without physically holding and seeing it first. The ring is solid feeling and a nice weight. The stones are evenly set and the prongs are more flush than appears in the pictures - which I was very happy about. Very nice piece at a very good price. 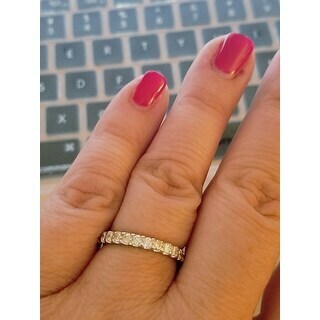 I have been wanting an eternity band for so long as a 10 year anniversary present to add to my e-ring. Finally, I was able to get my husband on board with this one because the price is outstanding for a wrap-around ring of this color and size. I am so happy with this purchase!!! It is so comfortable too! Doesn’t scratch or bite. I highly recommend this ring if you are looking for something sparkly but not too big to add to your stack or it’s gorgeous alone as well. Sizing was right on as well, ordered a 6 and it fits just like my other size 6 rings. I was VERY leary about purchasing diamonds online. I took the leap based on reviews and 100% satisfaction guarantee. My ring came yesterday. It's beautiful and exactly as described. 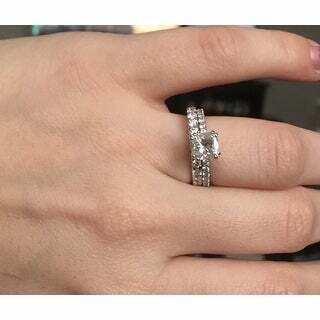 I compared prices at other online jewelry sites as well as retail stores, not one came even close to being able to match this price for comparable ring. 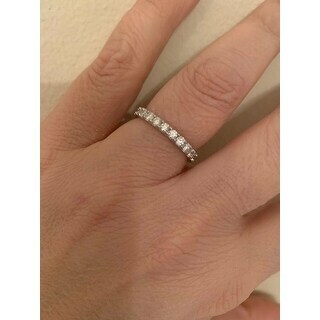 It looks beautiful with my diamond. Edit: I ended up returning this item and have been waiting over one week for my refund to be credited to my Visa. Was told it was processed days ago but no refund yet. Just called my bank. I was lied to. There has been no credit processed. Tried to call company. No answer and no voicemail. Had to open dispute with my credit card company and now going to file complaint with BBB. So beautiful. I was skeptical buying a piece of jewelry before seeing it in person, but I am extremely pleased. I love this ring!!!! It’s really pretty and sparkly. I wear it nearly everyday. Unfortunately one of the diamonds fell out after a couple of months. 😖 But I still wear it! Just keep it turned around. Aside from that, I’m very happy with it. I’ll get a new siamibd put in one of these days. Absolutely Awesome! My fiancée purchased this eternity ring as my wedding band. It’s a beauty! The diamonds aren’t huge but they are large enough, very classy and dainty, and they do sparkle and shine beyond belief...A great buy! We’ve seen many more rings of this style and size with a much larger price tag. Our appraisal came in at $, and on sale our cost was less than $...We’re VERY pleased! I just received my ring today and I am beyond pleased with it. It sparkles beautifully. I took a chance with ordering online an anniversary ring and I am so happy I did. Wow! I wish I bought 2! Excellent purchase for the price...love it..beautiful on it’s own..
Looks exactly as pictured, diamonds are shiny, clear and pretty eye clean. Sizing is a little big but it’s ok. Also comes with an appraisal of the piece from the company. I would definitely buy again from this vendor. It is AMAZING! It totally surpassed my expectations. The stones are beautiful and the quality seems great. I just received it so I’m not sure about durability, but so far so good. It also comes with an appraisal which is an added perk for insurance. 10/10 would recommend! Absolutely fabulous!!!! It fits perfect and looks great along with my wedding ring!! I am utterly please with this purchase!!! "Are stones treated or enhanced?" "Does it come with a certification?" Yes - it comes with a certificate and appraisal. I love mine - it has very high quality stones, better than what they say are the color and clarity. "How many diamonds are on a size 4 ring? also what size is each diamond? " "Tell me the sizes that are available"
"Can this be sized to a 3.5?" "Can this ring be sized to 4.75?" I needed a new wedding band and this one had so many positive reviews that I decided to purchase the ring.